Editor’s Note: This post is Part 3 of a 3-part series by Alan Coltri, depicting the history and significance of William Ellery Channing’s famous “Baltimore Sermon,” delivered in 1819. The sermon is so seminal to the history of Unitarian Universalism that congregations in the region celebrate it every year with a festive worship service that includes a keynote sermon, clergy from around the region in colorful regalia, and lots of music. The event, Union Sunday, has until 2018 been held at First Unitarian in Baltimore, the location where the speech was delivered. But this year, Union Sunday, a part of Unity Weekend, is being held in Columbia, Maryland at the UU Congregation of Columbia. The event is May 6 at 4pm and is free and open to everyone. Details are here. In Parts 1 and 2 of this series I set forth a short history leading up to the Baltimore Sermon, and examined the core issues addressed in the sermon itself. This history began with the Protestant Reformation in 16th and 17th century Britain, crossed the Atlantic with the New England Puritans, and then arrived in the 19th century with Channing delivering the Baltimore Sermon (1819). 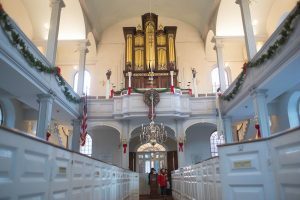 The sermon clarified the issues dividing the orthodox, Calvinist, branch of New England churches and the liberal branch which was applying enlightenment rationality to its theology. As tensions increased between the orthodox and liberal factions, the churches began to split, with groups of people defecting from “Standing Order” churches to form new congregations. The splits were often characterized by the members of the “the Church” holding orthodox views, while the “parish” became more liberal. By the time of the Baltimore Sermon, the issue of ownership of the church assets had reached the courts which came down on the side of the parish (1818) – arguing that the physical churches had been built and supported with tax dollars, so the ownership remained with whichever faction carried the majority of the parish population. At the time the theological split was developing among the churches of the “Standing Order,” there was a general increase in religious enthusiasm in the population at large, and new denominations were appearing and expanding: Methodists, Baptists, and Universalists. With this proliferation of churches, and the national Constitution standing against favored churches, the tax support of individual congregations had to end. The final elimination of tax support for churches in Massachusetts did not occur until 1834 with an amendment to the state constitution. Channing’s Baltimore Sermon was delivered into this period in which congregations were “choosing sides” (orthodox or liberal), or dividing based upon theology. By the time of the final dissolution of the “Standing Order,” approximately one quarter of the churches in Massachusetts became explicitly Unitarian. The larger fraction of the churches remained more orthodox and eventually formed the Congregational denomination. One would think that with the theological debates, the splitting congregations, the division of congregational assets, and the elimination of tax support, there would have been some organizational response by the Unitarian churches. But the tradition of individual church independence was strong and the liberties it provided were cherished. It was not until 1825, six years after Channing’s sermon, that any formal organization of Unitarians developed – and this was an association of individuals, not congregations, formed as a publishing house for religious material. Over time this new organization, the American Unitarian Association, added denominational expansion to its publishing interest and helped push Unitarianism westward into Pennsylvania and beyond. As part of this push westward, the Meadville Theological School was established at Meadville, PA in 1844. Years later, in the 20th century, the Meadville Theological School moved to Chicago, and then merged with the divinity school of Lombard College, a Universalist institution. Now called the Meadville Lombard School of Divinity, this seminary is the alma mater of UUCC’s Assistant Minister, Rev. Anthony Jenkins. The alma mater of UUCC’s Senior Minister, Rev. Paige Getty, is the Harvard Divinity School. Channing remained a leading voice of the liberal church throughout his life. In 1828 he gave another famous sermon, “Likeness to God.” In it he declared: “Our proper work is to approach God by the free and natural unfolding of our highest powers, — of understanding, conscience, love, and the moral will.” And “We discern more and more of God in every thing, from the frail flower to the everlasting stars.” These concepts, heretical at the time, advise us to use our human faculties to reach God, and to see God’s presence in the natural world. Unitarian Universalists living in the 21st Century would find the message, if not the metaphor, comfortably familiar. Unitarian Universalism was now well on its way to what it is today. Sunday: Car Wash AND Meeting!